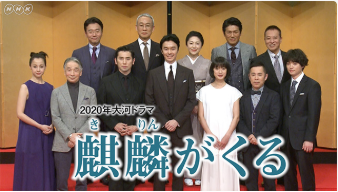 The cast of next year's Taiga Drama series "Kirin ga Kuru" in the chapter 1 (maybe) was announced on the 13th of March. Hiroki Hasegawa who plays the role of AKECHI Mitsuhide is featured in the series. (*) Nishimura acts MUROGA Masatake in "Sanada Maru". (**) Motoki appears in "Taiheiki" in 1991 whose script is written by Shunsaku Ikehata and he also writes that of "Kirin ga Kuru". John R. Graham will be in charge of the music in the series. The image below is from the official website of NHK. Hasagawa (standing in the centre of the front row) and other cast.